Hey, guys. I still have a few doubts here concerning the translation. Can you help me? 皮のむねあて - should 皮 be "leather" or "hide"? It seems more convenient to choose "leather", but I could be wrong. エルフのローブ - should this be "Elven Robe" or "Elfin Robe"? I don't know if there's a difference. エバーシング - "Ever Sing" or "Eversing"? I couldn't find anything about this armor. Probably made up by Konami. Also, I need better names for these 2 suits of armor. They must be as close as possible to the original Japanese; unfortunately, the literal translations won't fit. These two armors are identical in shape, but different in color, obviously because they're opposites. I was thinking of giving names of famous dragons to these two, but I couldn't find/remember of any. Elven = Tolkien, Elfin is more like a valid alternative. Since Castlevania references a lot of Tolkien's stuff, I'd go for Elven. I don't remember the source here, but it should be Eversing. You could always translate these to Firedrake Plate and Waterdrake Plate. Wanna go Tolken just like Konami did? Eärcaraxë/Rain-drake for water, Urulóki/Fire-drake for fire. "Waterdrake Plate" didn't fit well in the Equip screen, the letters got glitchy; but then I renamed it "Waterwyrm Mail", and it worked just nice. 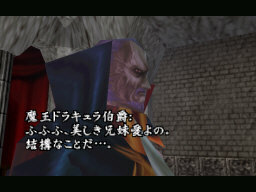 The 魔王のゆびわ was translated as "Satan's Ring", but it looks like 魔王 is referencing Dracula, like in the games below. Does "Count's Ring" look good, or engrishy? I don't think "Ring of the Count" will fit. I think Count's Ring sounds a lot better than Ring of the Count personally . Well, I guess I'm done here. There's probably nothing else to retranslate. I'm still finding errors here. Official Transl. : Uses 9mm Parabellum rounds. Was that ペ a typo or was it really meant to be a joke (Parapellum)? Don't confuse me with an expert, but unless there's some sort of pun that I'm not picking up on I'd say it's a typo. Personally I often have trouble differentiating between dakuten and handakuten with many fonts, they really looks almost the same. Well, I'm sure it's a handakuten. I almost didn't notice it. Also, the weapon is a handgun. If anyone's interested, there's a list of all the weapons in Japanese in the link below. Perhaps they did it because they can't mention names of real brands without permission, so they make a parody of it? EDIT: It's a joke weapon indeed, it's among the weakest weapons in the game. Compared to the Silver Gun's firepower (which is very similar in looks), the Handgun's mediocre. Then I guess you could keep the joke and localize it with the word rubber somewhere in there, something like "Parubberlum". Parabellum is latin for "Prepare for war"
I think the translation is fine unless I'm missing a pun, although Castlevania has never been to keen for puns. I say Parabellum is fine. Judging by how it's written, the bullets are fake, just like the Alucart equipment from SotN. Personally I prefer to stay true to the original, but I think most people won't get the joke. @Gemini: I liked Parubberlum, thanks. Did I translate this right? It's the description of the Valmanwë sword. Blade of vacuum that slices enemies to pieces. Also, does anyone here know where the X-Potion came from (a book, a myth...)? It's in this game, and in RPG games like Final Fantasy.